This Biograph short is another “rescue” movie in the vein of “An Unseen Enemy,” and may actually be the more exciting to modern audiences, although it was made earlier and lacks the star talent of the Gish sisters. Director D.W. Griffith packs considerable suspense into a short time span on a limited budget. Here, Dorothy Bernard (who we just saw in “For His Son,” and was also in “His Trust”) stars as a plucky young telegraph operator who seems to have several “gentleman callers” who stop by at the telegraph office. 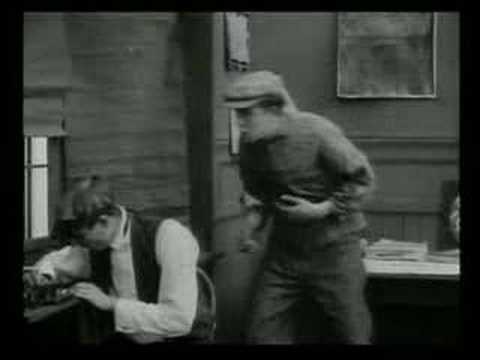 The first, a yokel, she dismisses politely, but she shows more interest in the Express Agent (played by Wilfred Lucas), though she chides him for thinking he needs to get out the office revolver when a cash box containing $2000 comes in. 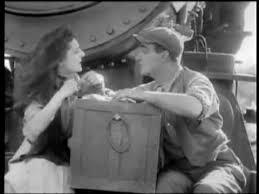 When the train comes in, it also carries two tramps (one played by Edwin August), who plan to steal the box! Dorothy locks herself into her office and refuses to give up the key, sending a wire to the next station calling for help. She scares the tramps by faking a gunshot and they decide to take the box and break into it later. They haul it to a railroad handcar and prepare to leave, but the girl runs out to stop them. They beat her and take her along for the ride. Now the tension builds and the locomotive, carrying Wilfred, races after them, both vehicles on the same track. The train rolls to a stop as the tramps leap off, but they are recovered and so is the money. Dorothy and Wilfred ride together on the locomotive’s cow-catcher, sharing a sandwich and, apparently, continuing to bicker. What? I’m not helping any tramps. Griffith puts cross-cutting to full use here, and in general develops the story visually with minimal intertitles. Actually, where titles do come in, they tend to be disappointments: I had imagined an elaborate SOS from the girl’s furiously bouncing telegraph fingers, but the title card says all it says is “HELP…TRAMPS…QUICK.” At any rate, while the “girl” in this picture is ultimately a damsel in distress, she is not above taking action for herself. First, she engineers her own salvation through her knowledge of technology and Morse code. Second, she comes up with a clever way to fire off a bullet with no gun, hammering a pair of scissors into the primer (I have no idea if this would work, or be safe, in real life, but it looked good on film). Finally, even though she has no way to stop the thieves, she bravely runs out of her safe office to try to stop them from stealing the money. The one criticism one might make is that there is obviously no way the handcart is going to outrun a locomotive, so the ending is a foregone conclusion, but the tension is heightened by the fact that the girl is on board the cart, and the men on the train have no way to know this, and so might smash into it with the locomotive. On the whole, I find this one of Griffith’s better efforts.